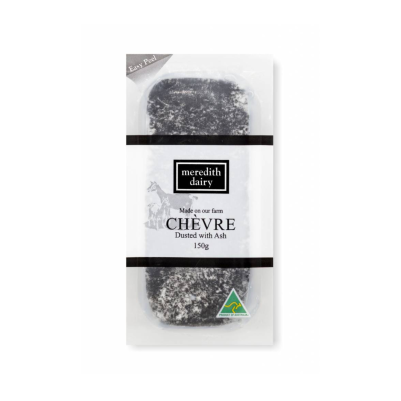 Meredith dairy's award winning chevre, dusted with ash. Dusting cheese with ash is a tip of the hat to an old French method of preserving fresh milk cheese. The technique also helps balance the acidity and create an incredibly creamy profile. Unwrap from wax paper and place on a cheese board. The black ash on the white goat's cheese looks absolutely stunning. Serve with dates or in season figs. Fantastic just by itself too. 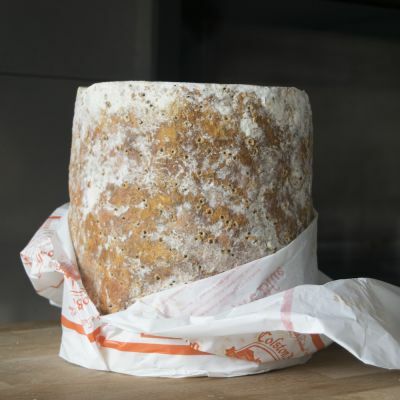 The ash that is dusted onto the chevre helps balance the natural acidity of the cheese. The ash chevre is our cheese board cheese, and is best served with fruit, cheese pastes or simply honey.